In his previous book, Cry Yourself to Sleep, Jeremy Tinder explored the lives of three characters still in the early years of legal adulthood. 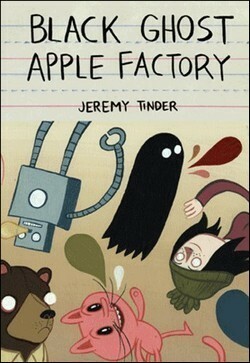 His new reduced size comic book, Black Ghost Apple Factory, is a collection of his mini-comics from 2004-2006. In the opening tale, the title story, a little black ghost must produce apples although he’d rather run through the forest reliving a recent successful romantic encounter. Next, in Joe Matt fashion, Jeremy navel gazes, and in a second story, “Grizzly or How I Spent My Spring Break,” Jeremy finds an edgy roommate while hiking. The book finishes with three somber and/or touching tales, including one starring Jim (the rabbit from Cry Yourself), who is still having early life crisis. THE LOWDOWN: Using light surrealism, anthropomorphism, and humorous fantasy, Jeremy Tinder explores the disappointments and confusion of youth, but his work recognizes how little control his characters (and by extension, the readers) actually have in their lives. These are vignettes more often than they are stories, but like indie cartoonists who work in mini-comics and short, short stories, Tinder makes his point with compact efficiency and gentle wit. POSSIBLE AUDIENCE: Mini-comics and indie fans will enjoy these alt-comix tales, some of which feel like newspaper comics.